A Testimony to the Public’s Astronomy Interest. This year’s Winter Star Party at the Kopernik Observatory & Science Center was a very welcome event after having to cancel the event last year due to weather. We typically don’t schedule the public Friday’s at Kopernik in the winter time, as we have found public curiosity in observing Jupiter or distance globular clusters tends to go WAY DOWN proportionally with the temperature. So it’s nice to hold one higher profile event each year to keep pushing the interest in astronomy out to the public in the local area. Many of us were worried what the turnout would be light due to the fact that the skies were completely socked in with clouds. We had a great speaker lined up, Dr. Michelle Thaller director at NASA Goddard Space Flight Center, and her topic “Things That Go Bump in the Dark” that covered the subject of Dark Matter. We really wanted a great turn out with such a premiere speaker like Dr. Thaller visiting us. 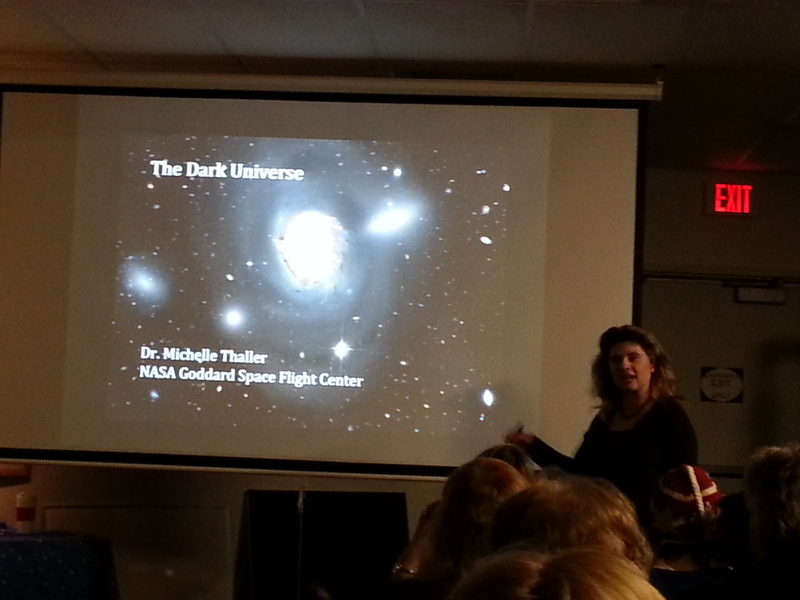 Kopernik Observatory – Dr. Michelle Thaller Kicks off A Lecture on Dark Matter. The night turned out amazing. 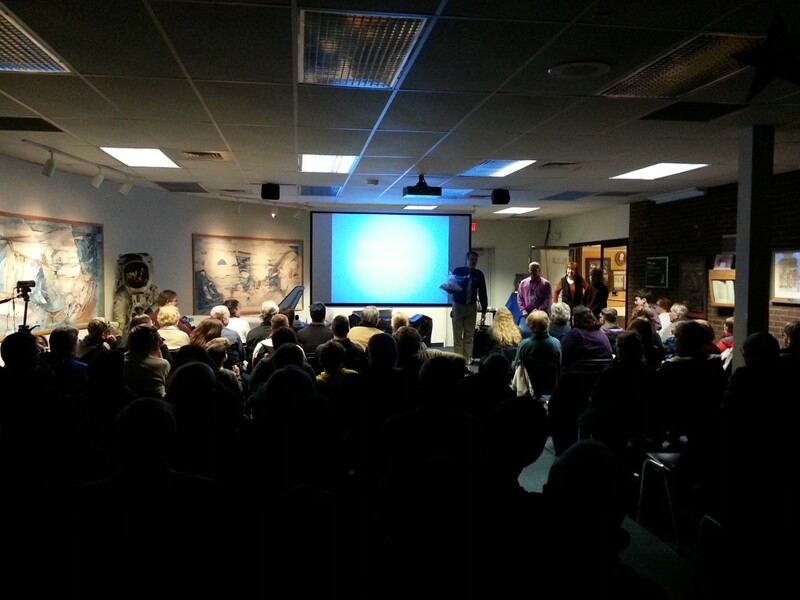 The Kopernik Winter Star Party was a standing room only event, and it was great to hear Dr. Thaller speak. She had great lines like “Most of the universe is made up of ‘dark matter,’ and what we are made up of is ‘Doesn’t Matter.’” The discussion was very informative, and was a great 45-minute introduction to the concepts surrounding Dark Matter. The crowd was also entertained with Roy William’s discussion on comets, his preview of Comet PanSTARRS, and later in the Year Comet ISON. 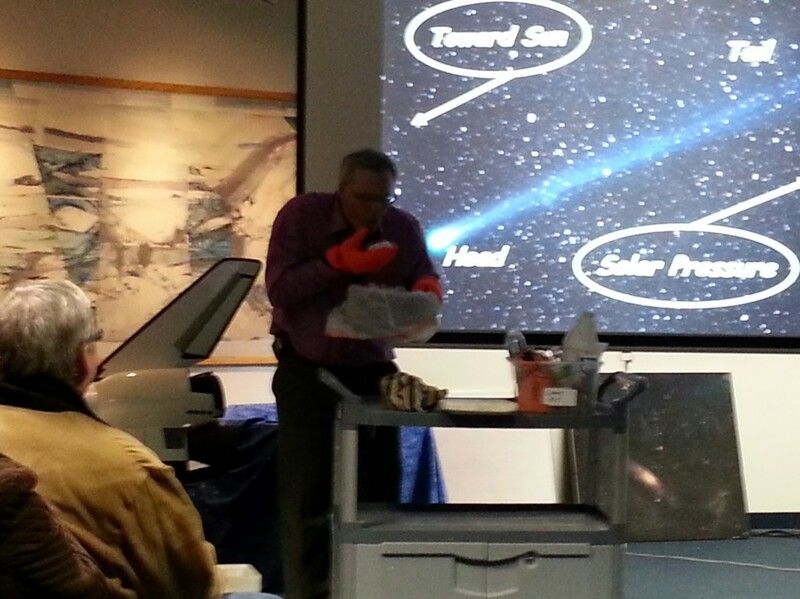 He also did his trademarked comet demonstration where he makes a comet out of a variety of materials, and passed around a 3lb Canyon Diablo meteorite to let people experience a piece of material that came from space. Below is some video from wicz.com FOX 40 News where Dr. Thaller discusses briefly the subject of her lecture. As another highlight, there were birthday cupcakes served to the crowd, after the singing of “Happy Birthday” to Nicolaus Copernicus for his 540th birthday celebration. It should be noted that Kopernik Observatory is named after Copernicus, as his name in Polish is Mikolaj Kopernik. Unfortunately, there was no observing to be held, but it was great to see so many people enthusiastically show up to share and experience astronomy without the crowd pleasing eye candy through the telescopes. The turnout was a real testament for the general public’s curiosity of the universe that surrounds them. This entry was posted in Events and tagged WinterStarParty. Bookmark the permalink.